The pristiophoriformes, also known as saw sharks, are an order or rare and unique sharks. They have a saw-shaped snout edged with sharp teeth that they use to slash prey. They’re most commonly found in the Indian and Pacific Oceans. Their most emblematic species are the @common sawshark and the @longnose sawshark. The African dwarf sawshark is a newly discovered species of sawshark found off the coast of Eastern Africa. The first specimen was discovered in Mozambique. Like other sawsharks, it has a long snout with teeth that point outward. The rostrum… read more. The Bahamas sawshark is a species of sawshark found in the Western Central Atlantic, most commonly off the coast of Bahamas and Cuba. 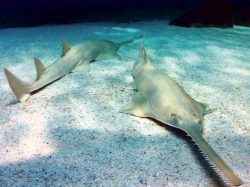 Like other sawsharks, they have a long rostrum (snout) with outwards-pointing sharp teeth, which they use to… read more. Also known as the Japanese Sawshark is a species of sawshark in the Pristiophoridae family. This species is uncommon through its range, mainly found in the northwest Pacific distributed throughout Japan, off northern China from the East China Sea, the… read more. 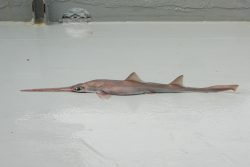 Lana’s sawshark, or the Philippine sawshark, is a recently-discovered rare shark species found only in the Philippines at depths of between 230m and 590m. They’re presumed to be ovoviviparous but the average litter size is unknown. The maximum total length… read more. The Largetooth Sawfish had been common all around the world where they can be found in waters such as the Eastern Atlantic, Western Atlantic, Eastern Pacific and Indo-West Pacific. Biology and Behaviour Presumably, the largemouth sawfish can grow over 6.5… read more. Mainly known as the Long-nose Sawshark or Common Sawshark, is a Sawshark of the family Pristiophoridae. 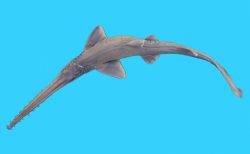 Biology and Description: The Long-nose Sawshark has a slender, slightly flattened body with a very long rostrum that can make up to 30% of… read more. Longcomb Sawfish have multiple names such as: Green Sawfish, Narrowsnout Sawfish and Olive Sawfish. They are possibly the largest sawfish species where they can grow to lengths over 7 m, but currently, longcomb sawfish greater than 6 m are rare. They… read more. This species also known as the Short-nose Sawshark is a sawshark of the Pristiophoridae family. This shark is endemic to the waters of southeastern Australia from Eyre in the Great Australian Bight to Montague Island in New South Wales, including… read more. Do you have images or videos of Sawsharks – Pristiophoriformes?